The Grissom Station Core has been successfully launched from the RUD space center early this morning. Onboard were Kerbalnauts Bill Kerman and Jebidiah Kerman who courageously rode the experimental space craft into orbit. The Grissom 1 Station Core is a massive and long-term science experiment to test a variety of new technologies in a zero gravity environment that will further our knowledge of long-term manned space flight. 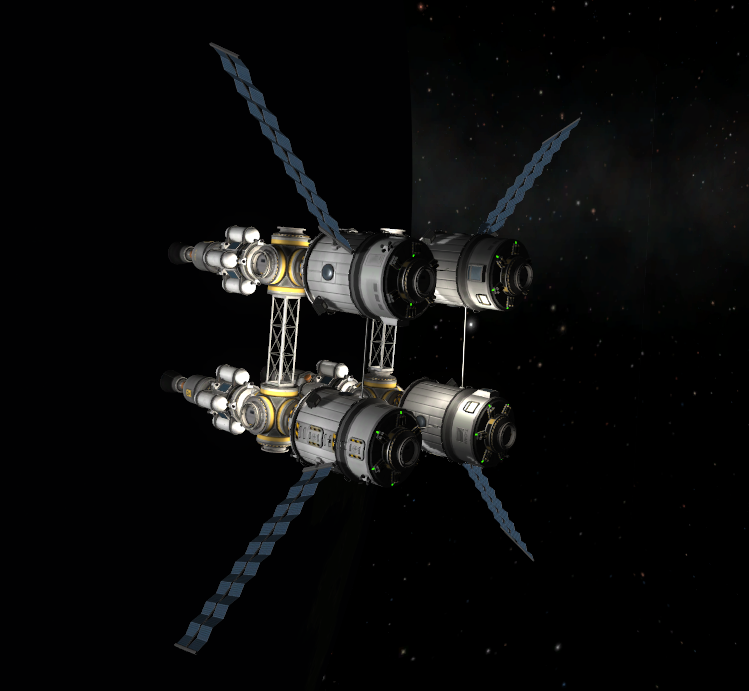 The station is large enough that it can support 24 Kerbalnauts for an indefinite amount of time in a comfortable manner. It can also support other space craft through the use of its 12 docking adapters. The station is named in honor of former NASA Astronaut Gus Grissom who was killed by a fire on board Apollo 1. The launch vehicle was one of the largest ever in RUD’s short history, weighing in at 540 tons as it as on the launch pad this morning at the space center before launch. The launch vehicle had 20 rocket motors on the first stage that produced a total of 9,440 kN of thrust, the most thrust produced by a launch vehicle yet. The second stage consists of four dual purpose atomic rocket motors that will also act as remote-controlled tugs used to maneuver future modules for the space station into position for docking and configuration. 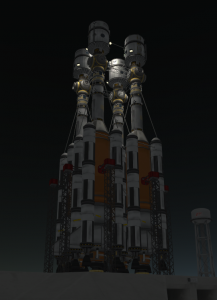 RUD officials have stated that the station will be the first step in their projected interplanetary kethane mining mission, which will supposedly create millions of jobs worldwide and is projected to bring in over 5 trillion Kerbal dollars in cash flow; a huge boost to world economy. This comes a week after the arrival of Eve Express and two months after the arrival of Duna Express which were both missions to explore the kethane deposits on distant planets that have returned results that were better than first expected. It is truly a bold step further into the cosmos for Kerbal-kind.